You guys made a difference for all the Marines stationed here in Al Saqlawiyah, Iraq. 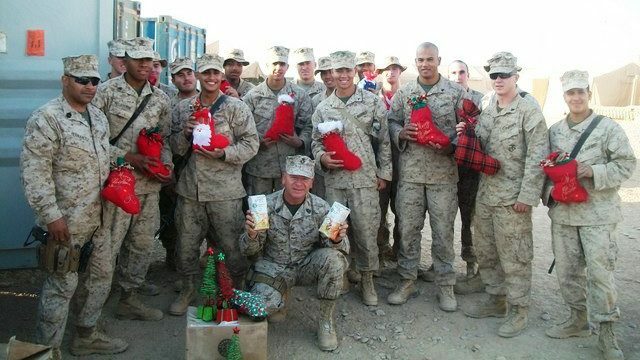 Every Marine in Golf Company received a bag of cookies and a Christmas card, which were all hung on the wall, covering the whole firm base. We also made a basket of your cookies at the front entrance, and people came and went all day from Fallujah and Ramadi grabbing handfuls. I am sure you guys have the record for most boxes sent to Golf Company. Everyone was so amazed at how much time you put into making our Christmas better. Even though we were away from our families during the special time of Christmas, we still felt loved. I just wanted to take the time to say thank you for the packages and your support. It means a lot to the Marines and I, knowing that there are great people like you and your organization that support us and what we are doing here in Iraq. 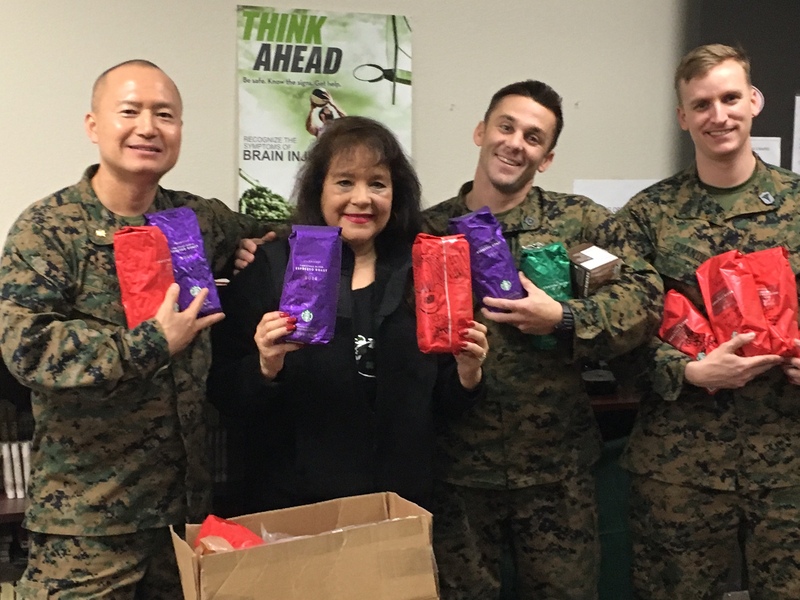 The Marines really enjoyed the cookies, the socks definitely came in handy and the Bibles were distributed throughout the company. Your packages have been by far the greatest display of love and support for the Marines deployed here in Iraq. It takes a special type of American, a true Patriot, to put in the time and effort that you and your team put into the care packages. My Marines and I received your packages yesterday. I wanted to take this time to write and say thank you for all the goodies. It came at a great time. We're especially thankful for the baked goods. Also, thank you for the gillette shaving cream and deodorant. It's the best stuff around! 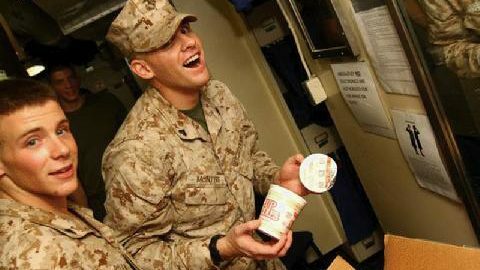 Care packages like your keep their spirits high. Thank you again! First I must thank you for your contribution to our efforts overseas.I know socks do not sound like a huge contribution but to a Marine socks are almost as precious as gold. We walk many miles in the hot desert for hours on end. It is imperative that we take care of our feet, because our lives depend on it, So to reach into your pack and finding a fresh pair of socks is like finding your favorite toy underneath the tree on Christmas morning. I appreciate your thoughts and prayer. God Bless. We just want to thank you all for making our holidays great. My children had a wonderful time at the party. And with their dad being gone it made all the difference. Thank you all again. Many Blessings to you all. Thank you so much for making that day so special both for our families here and our deployed Marines. I know by now they have enjoyed all the cookies and must be making good use of all the hygiene gear. You and your team continue to be such blessings to us all and we look forward to working with you as we move closer to homecoming and the "homestretch" of this deployment in the coming months. I am so thankful that God has called you - the perfect person for his mission to truly bring his words and works of comfort, hope & promise to us all. Semper Fi & God Bless. What a fantastic package, we are really overwhelmed by your team effort on our behalf. The cookies and suntan lotion are the perfect Fathers day gift for these guys. We place all the items on a table where folks help themselves, and the items don't sit there very long. I have 5000 US & 4000 Iraqis in my regiment. Just last week we opened 3 factories here near Fallujah putting hundreds of folks back to work and able to care for their families. God Bless you and the entire Words of Comfort, Hope & Promise organization. Semper Fidelis. I want to take the opportunity to thank you for your overwhelming kindness and generosity. The socks are great. 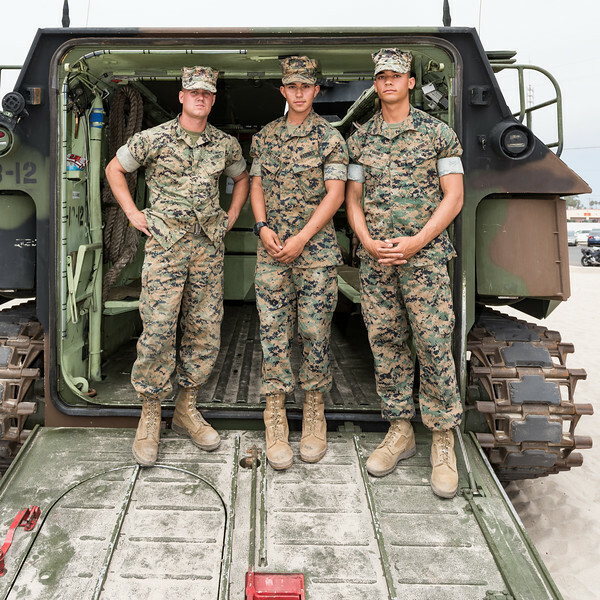 It is Americans like you that make us, the U.S. Marines, want to excel and represent the great ideals and values that we hold dear around the world. It is our greatest honor to represent wonderful American's like you on foreign soil and on the battlefield. I can tell you that your Marines are working very hard to set the conditions in Iraq that will enable long-term stability and freedom. 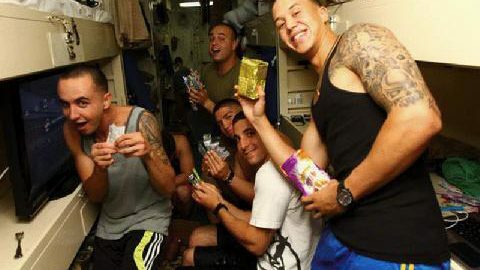 Your care packages are wonderful and always bring a smile to the face of our Marines. Semper Fidelis. We have been in Hadithah, Iraq for 3 months now, and as the holidays approach, we find it heartwarming and uplifting to hear and see support from back home. I of course ensured my entire platoon of 46 men each got a hold of everything you've sent. In military towns, people sometimes become numb to us. It is overwhelming and humbling to see so much effort you make, and time you take, to think of us. As for the rest of us left here to finish the job, we remain strong because of folks like you. Your letters and packages remind them of that. On behalf of the spouses and Marines of 1/5, I want to thank you from the bottom of my heart. You and your group of volunteers went above and beyond to make our event a success. You all made each of our wives feel special. Everyone was blown away by the gifts you had for us. Thanks for adopting us and I look forward to seeing you soon. In my 21 years on active duty I've been on many deployments and have now served 3 combat tours in Iraq. In all that time I have never been so fortunate as to bear witness to the generous level of support so freely given by you and the rest of our friends at WOCHP. The active support of our family day and on the day we left, you all showed up with goodie bags and kind encouraging words. Since our arrival here, we've been overwhelmed by boxes of homemade cookies and much-needed hygiene items. We can't begin to thank you enough. Being separated from a spouse is one of the most stressful experiences a woman can face. Add to that, the war-time combat situations and we are found grasping at any ounce of hope or encouragement to simply get through the days. I have heard testimonies of complete AWE after our January 21 Hawaiian Luau Pampering Party. To say that we were spoiled by you would be an extreme understatement. WOCHP is changing lives. 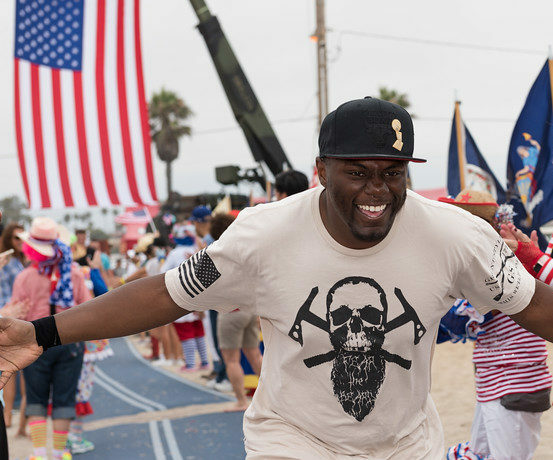 You have not only encouraged us to continue putting one foot in front of the other, you have inspired us to find new inventive ways to serve other military families during the difficult trials of deployment. Thank you for the packages that were sent by your team. We received them here in Hadithah, Iraq yesterday, June 2nd. 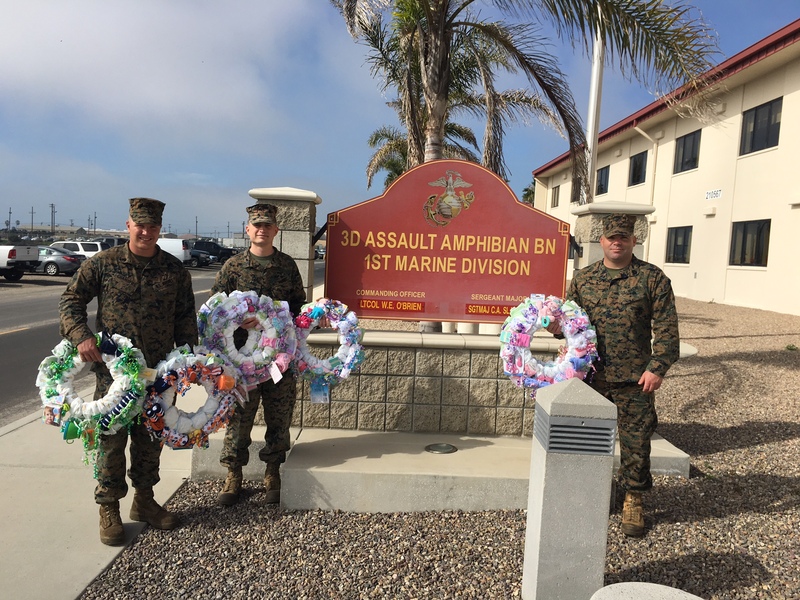 It really helps the Marines here, when they know that people back home are thinking about them, and appreciate the job we do. Sometimes among the general negative attitude towards us here, it is easy to lose sight of that fact. Organizations like yours provide a huge moral boost and give a much needed taste of home! Once again thank you for your thoughts and generosity!